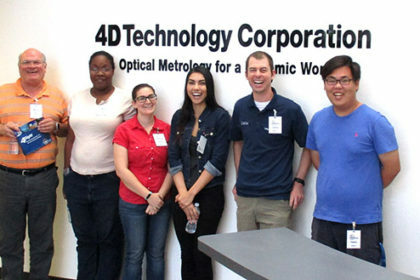 4D Technology recently hosted students from the University of Arizona’s Optical Sciences college on a tour of the 4D facilities in Tucson, Arizona. Kevin Erwin, who teaches an optical engineering outreach class at Optical Sciences, arranges a tour each semester to a local company that manufactures products involving optical technology. The tours help students, both undergraduate and graduate, to get a clearer idea of the daily lives of optical technicians and engineers. In turn, the students incorporate what they learn into their recruiting presentations for area high schools.